If fried dough is one of the most popular pastry genres worldwide, sweet pancakes or crepes must be a close second, and we can’t complain about that. The latest pastry post-doc feature is a sweet pancake from Indonesia, Terang Bulan. Terang Bulan means full moon, and it is named because of its round, moon-like shape. It is basically a thick, puffy pancake, folded over and filled with evaporated milk and other fillings like chocolate, chocolate sprinkles or nuts. Terang Bulan is also popular in other parts of Southeast Asia under different names, like Martabak Manis and Apim Balik. 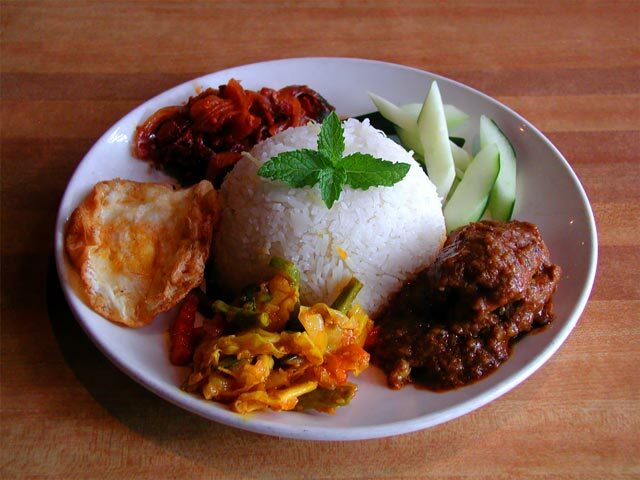 Here is a recipe from Ridha’s Kitchen, Food.com, and a Malaysian version with peanuts from Curious Nut. We ended up at Sedap (102 Old St, London EC1V 9AY) thanks to a concert that never occurred. We were in the impossibly trendy Shoreditch waiting for a concert that was supposed to begin at 7, but by 8:30, the show had no signs of starting, and was being filled with more young teenagers than a One Direction concert. We decided to just cut our losses and grab a bite to eat. We had heard good things about Sedap’s unique take on Malaysian cuisine, so we decided to give it a try. Located within walking distance of Shoreditch, in a much more low-key (and less trendy) area, Sedap serves authentic Malaysian Nyonya food in a simple, serene setting. To contribute to the calm, there was even a little fountain in the corner where we were sitting (It was dark so unfortunately the picture did not come out at all). Nyonya cuisine (sometimes called Peranakan) is the result of the intermingling of indigenous Malay, Indonesian and Chinese techniques and ingredients, and is rare to find outside of Malaysia and Singapore. When we visited Singapore in 2010, we tried Nyonya cuisine for the first time, and we instantly loved the complex and diverse flavors. Sedap’s menu was pretty concise and we saw some dishes we had not seen since our trip to Singapore, which was welcome, including the emblematic Hainanese chicken rice, in a chili and soy sauce (£8.80). Also on offere were several Laksas, including Singapore Laksa, thin vermicelli noodles with fish cakes andshrimp in a curry sauce (£8.95). “Laksa” is a common type of dish in Nyonya cookery and refers to noodles in a soupy coconut milk curry (of which there are many, many variants). We ordered one of our favorites from Singapore, Prawn/Shrimp Lemak (£8.70), and a new-to-us dish: Beef Rendang (£7.95). Both dishes came out pretty quickly and were perfect portions to share. The Rendang was advertised as being in a spicy, “almost dry” curry, meaning it was more of a thick paste that coated the meat. Not a photogenic dish, but spicy, flavorful and tender. The prawn lemak was a coconut milk curry, with plenty of lightly spicy soupy-ness and a strong lemongrass flavor. Both dishes were flavorful and complex, and had clearly been cooked to order. Overall, we found the food at Sedap to be unique and reasonably priced (for London) for the quality. We wish we had more time in London to explore more of Sedap’s Nyonya dishes and flavors. But even if we won’t be back for a while, we encourage people to get off the tourist track and try something new beyond the typical curry. Boxing Day is one of those holidays that we always remember every year, but we are never quite sure what to do or make in honor of a day which was historically for giving gifts to servants (perhaps some Downton Abbey themed recipes would be appropriate?). There really is nothing to do in the US to celebrate Boxing Day except perhaps to enjoy an extra day off from work, do some shopping, or continue your holiday binge. However, in Singapore and Malaysia, there is a special dish to mark Boxing Day – Curry Debal – also known as “Curry Devil” or “Devil’s Curry.” Devil’s Curry varies household to household, but is basically a strong, spicy, ginger and chili curry made from whatever leftovers (usually meat) that you have around the house from Christmas celebration feasts. 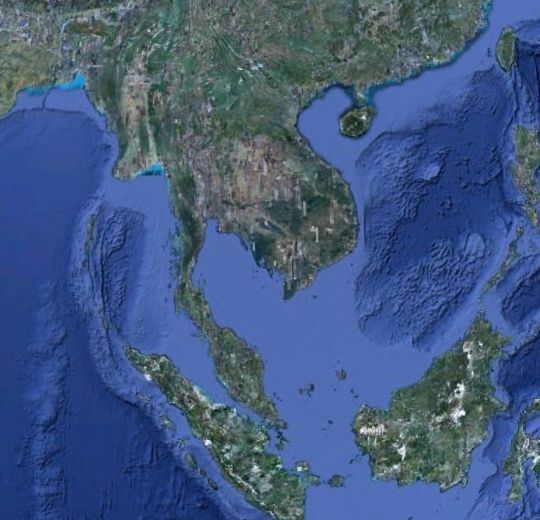 The dish descended from Eurasian communities in Southeast Asia, and perhaps even has a historic Portuguese influence, when Portuguese traders coming from Goa arrived in what was then known as Malacca. The dish remains extremely popular in Malaysia and Singapore today, and it seems pretty easy to make. The previous links will provide you a great basis for Curry Debal – but don’t be afraid to experiment with your own leftovers! Jalan Alor is known as Kuala Lumpur’s “eating street.” Much like Singapore’s hawker markets, Jalan Alor is lined with small stalls and some larger restaurants, each boasting a specialty or regional cuisine. By day it looks a little quiet, most of the food stalls are shuttered, and the street is full of parked cars. 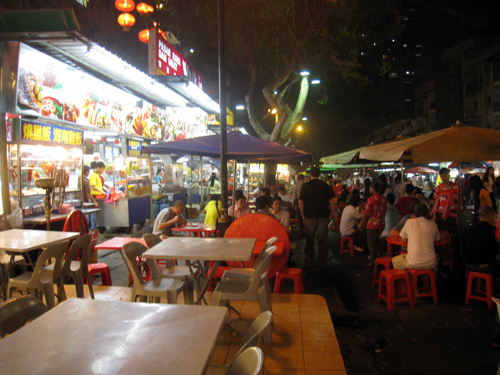 But by night, Jalan Alor explodes and overflow seating takes over nearly the entire street. We arrived at Jalan Alor at about 2 PM, and it was just about a ghost town, however we did manage to scrounge up some eats. We ducked into one of the few open stand for some curry. Malaysia and Singapore boast many of the same types of cuisines, so the food was familiar to us. M ordered a bowl of BBQ Pork with noodles and I got the dry curry mee, a gritty curry that is almost more like a marinade than a sauce. BBQ of various types, including BBQ chicken wings is one of the specialties on Jalan Alor, and M enjoyed the sweet and spicy tamarind sauce. After a foot-busting day of wandering around KL, we arrived back at Jalan Alor at about 11Pm, and it was absolutely packed. This time we didn’t have to search out food – it was everywhere. For our late night dinner we split a large carrot cake. 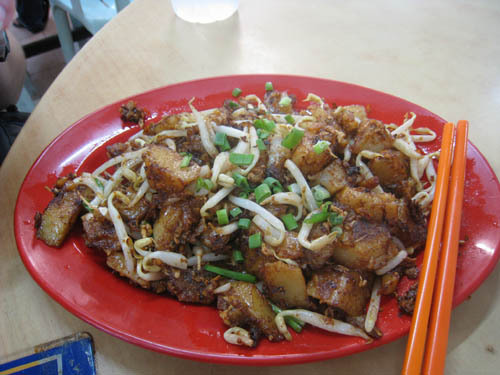 Carrot cake in Malaysia, also called chai tow kway, is not what it seems. Instead of a cakelike texture “carrot cake” is almost like a Spanish frittata, and is an egg dish full of daikon, radishes and green onions, stir fried in soy sauce. Noshing on our carrot cake under an umbrella on a crowded street was the perfect way to finish our 12-hour tour of KL. L and M head to Singapore, Malaysia, Thailand, and Cambodia. With an outpost in Chicago’s Chinatown, the Penang empire is spreading Westward with a new location in Arlington Heights. M and me, along with our Junior food editor A, are all big fans of Asian foods, so we were excited to try something new. Malay food itself is bit of fusion between Malay, Thai, Chinese, and Indian cuisines, so we were excited to sample this variety. Though Penang’s building formerly housed a burger joint, We were impressed by the sophisticated, modern decor at Penang and the airy space. In the nooks and crannies of the restaurant there were little personal touches everywhere – including a series of gold Buddhas standing watch. The menu at Penang is wide and varied featuring curries, noddles and meat dishes. I ordered Curry Mee ($7.95) – chicken and shrimp with rice noodles in a coconut broth. The curry came in a bowl with tons of tasty broth and round rice noodles and was rich and delicious. 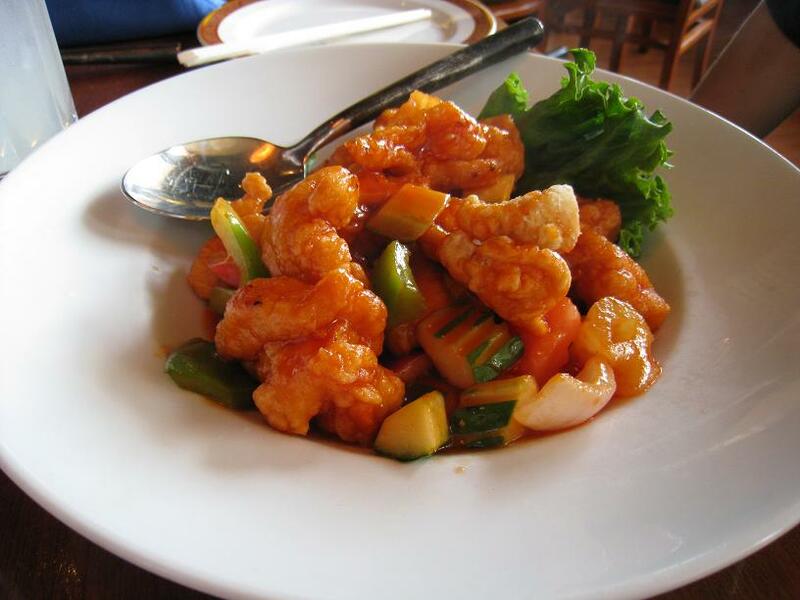 A ordered Malaysian sweet and sour chicken ($11.95). Much like the common Chinese dish – it consisted of lightly breaded chicken, Tomatoes, cucumbers, onions, bell peppers, sweet and sour sauce. However, the sauce in Penang’s rendition was tangier and not as cloyingly sweet as S&S chicken usually is. M ordered the Ayam Rendang ($11.95) – onion, lemongrass and red chili paste in a coconut gravy. The dish was pleasantly sweet, but with some kick to it. Of all of the dishes, this one had the most Indian influence. The service at Penang was very attentive and always arrived with a smile (at least out kind waiter did). To M’s delight, the waiters at Penang were quick at refilling our water glasses. Everything was delicious and unique, and A enjoyed her first foray into Malaysian food. We were tempted by the mango smoothie ($3.50) on the menu, but our entrees left us full. Maybe next time.